← History and Folklore of the Whiteshell Park South: Republished. There is no fish, and no time of year…that has generated more fishing stories than fall musky fishing. 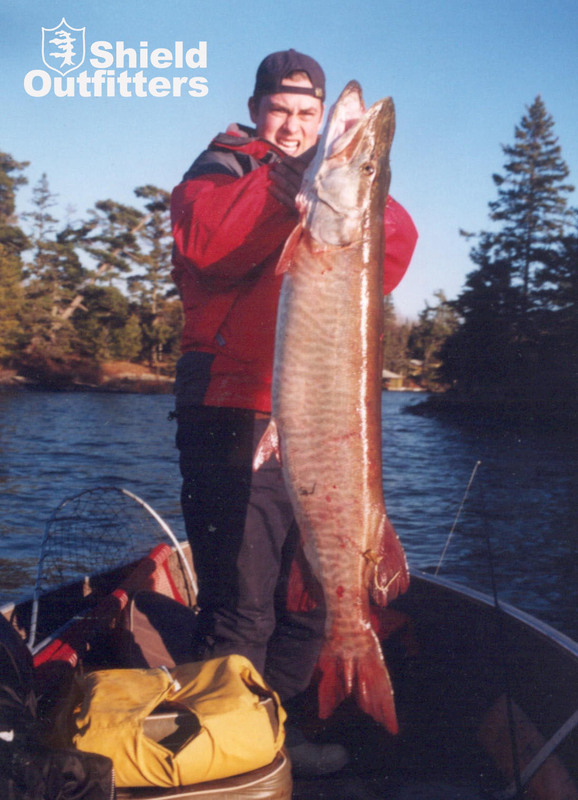 For the big fish-angler, no question, the October/November time frame is the annual crusade to catch a ‘Legend of the Fall: the elusive musky! 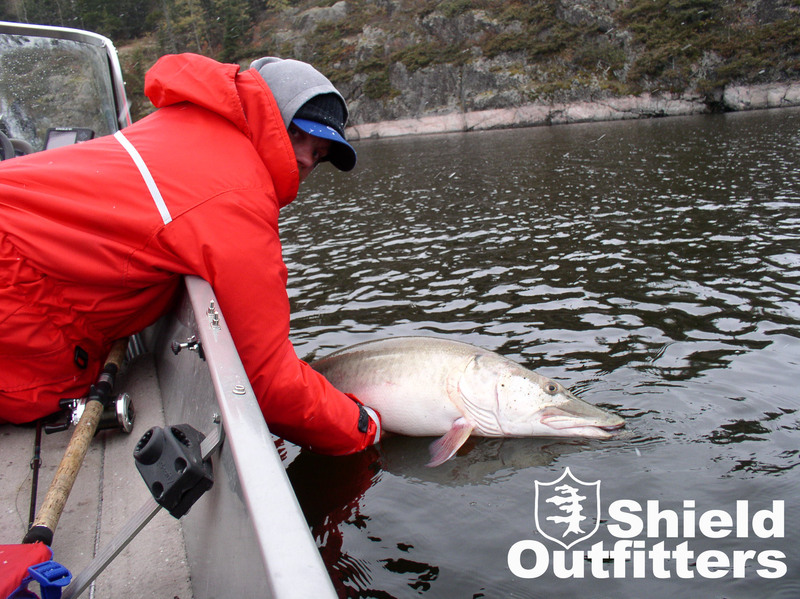 At Shield Outfitters, we spend most of our time guiding the Whiteshell as a rule… but there are exceptions. Since there are no muskies in the Whiteshell, one must trailer down the street to Lake of the Woods for some of the best musky fishing in the world. There, we spend a day or two every year with clients who are looking for the fishing experience of a lifetime… and we are happy to oblige. Muskies require some specialized gear and knowledge, but even a beginner can make it happen with a little guidance. Armed with an array of trolling baits, and the following game plan, we regularly put our clients on the fish they are looking for. Fishing for one of the ‘Legends of the Fall’ can be exhilarating, but one has to be prepared to put in time paying their dues. People look at you strangely as you tell them of trolling during blowing snow, or breaking ice to launch your rig. One must experience it to capture its many rewards, and there are many. Actually landing a musky is just one of them. Those who focus just on the catching, quickly lose interest, as the long ‘flat lining’ between strikes can lead to discouragement. When the focus is on the hunt, the joy of the sport reveals itself. Robert Service in his poem, Spell of the Yukon, articulated this beautifully when he wrote: “Yet it isn’t the gold that I’m wanting so much as just finding the gold.” This is something curiously more understandable when we are very young. Musky hunting is not fishing; it is angling’s great adventure. For those who are not big fish veterans, let me first frame the fall season for you. The shorter days and colder nights of September drop water temps, and sunlight hours wane. This triggers a seasonal reaction in the entire food chain. Ciscoes and whitefish that were in the deeper waters of the lake now begin to move shallower, coming onto contact with shoreline lips and reefs. Summer musky hunters, casting buck tails and jerk baits at open water reefs, hope to trigger muskies that are resting in the shallow warmer water. This elevated water temperature increases their metabolism, allowing them to digest more efficiently… then it’s back down to the smorg. Now that fall is here, their deep water forage (ciscoes) move up and reefs become ambush points, not just a place to relax after a meal. Now, instead of dropping buck tails up in tight near the visible reef, bumping a deep diving bait 10 – 20 ft. down, across the tongue of a reef is the ticket. Muskies will often suspend over deeper water underneath baitfish schools, so the deep water off reefs and island points cannot be ignored. Those who just concentrate on the reefs and islands alone miss out on some truly big fish water. NB: The thing that “gold plates” a reef, an island, or a stretch of open water, is the presence of baitfish, the more baitfish, the more potential. I often refer to the old National Geographic specials with the impressive herds of gazelles grazing on the African Plain. Nearby there will always be a pride of lions in the tall grass. Hmmm. The game plan pure and simple: Go to musky waters (Eagle Lake, Lake of the Woods, Winnipeg River, to name just a few), and troll the crank bait of your choice 3-5 mph through a predetermined route of islands and reefs. As fall progresses and water temperature drops, your trolling speed should drop with it. Be sure to note on your sonar the areas and depths you are encountering the greatest concentration of baitfish. These spots will become your “milk run” on day 2. Some of our favourite trolling baits are the 10” Believer, Mirro-lure, Jumbo Rapalas, Jakes, Grannies, and even Reef Runners. 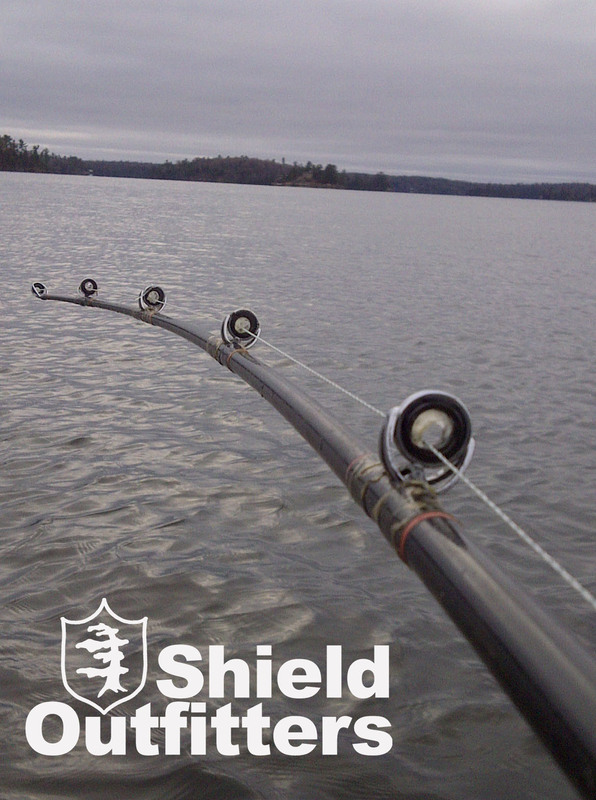 We provide them all, as well as rods and reels. 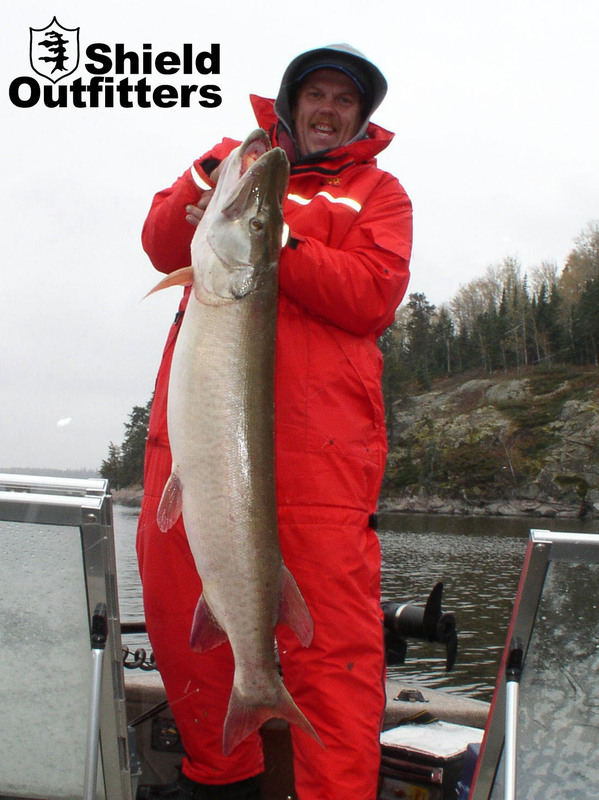 If you are looking to buy, then your local tackle retailer will set you up with the right reel, pole, the lures mentioned, and more (Figure 8 Baits in Kenora is a musky specialty shop and is excellent – just ask for Ryan). The important thing is to have baits that will troll at varying depths to put you in the zone. The baitfish tell you where the zone is, so pay attention. Oh yes, most important of all, buy, borrow, or make, a musky cradle. Nets are very hard on the fish (split tails), and if you hold a fish up by the gill plate, make sure it is just a quick photo then release it. Holding a fish vertical for an extended time could cause internal damage. We usually take two or three quick shots including the release. Cradling the fish in your arms is an option but leave your suede jacket at home. 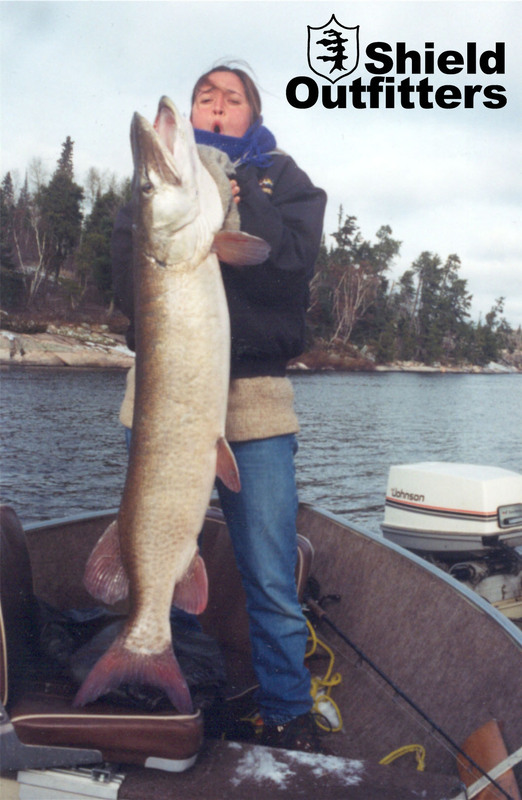 🙂 Here are some closing thoughts for those who have caught muskies and now hunt for the fish of fishes…muskies over 52”. Consistently catching these bruisers often means a different approach. Some time ago I guided a friend to a personal best 54 incher that was featured in a local fishing mag. This fish was caught on a 10” Believer trolled along a island rock wall over 55 ft. of water. In the fall, this is a favourite haunt of big fish. They will tuck in along the wall, or suspend under schools of baitfish moving along these underwater palisades. The more structural elements you have in association with these walls the better. This particular location is situated at a necked down area connecting two major bodies of water with an island and an open water reef close by, but it’s still not worth a look until the baitfish show up, and then…I can’t stop working a spot like this. All it takes is for one “Legend of the Fall” to show itself and you would fish a year straight without a bite to see her again. That’s fall musky fishin’, angling’s great adventure, and I love it. 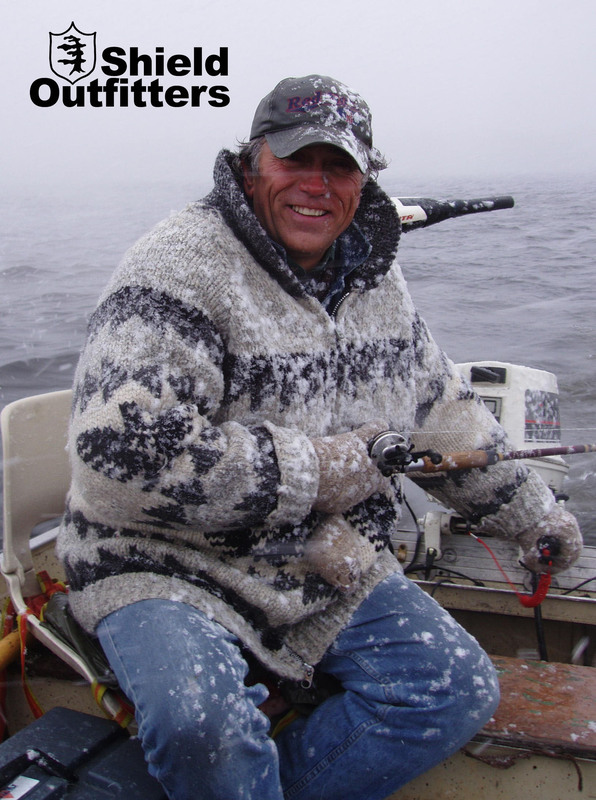 – Dave Abbott, Shield Outfitters guide.